It close to great views, restaurants and dining, walk 2 min (500 m) to Spark Arena, family-friendly activities, and nightlife. You’ll love my place because of the location, the people, the ambiance, the outdoors space, and the neighbourhood. Master bedroom with a fresh air exchange system to maintain you a quiet and privacy of sleeping. We do on site check in to make the most convenient for our guests. We do the entire home clean and change bedding sets after each group of guests check out. We offer the free unlimited VDSL on site and all rooms Wi-Fi. A Big 55' Full HD LED Smart TV, A modern open kitchen with High quality cooking utensils, also a Nescafe Dolce Gusto cafe machine was prepared for cafe lovers. just go to 24 hours Super market at downstairs to buy your favorite capsules and enjoy. Do you like shopping? About 3~5 minutes walk from Chanel / Tifany and Co., Nespresso Coffee / Boss / Cucci / Louis Vutton / Coach / Prada / Dior / Elizabeth Arden, Pandora / Naveya and Sloane Jewelers and Walker and Hall Store. At the prime Britomart Transport Center(Bus/Train/Ferry) location, you would use Auckland Public transport network easy to visit around Auckland , sea, and islands. Check in by appointment from 2pm to 10pm. Late check-in after 10pm there is extra charge $20) Check out at 10am. Late check out please enquiry for availability.. No smoking, Not suitable for pets, No parties or events. Please keep noise to a minimum when you are in balcony and elevator area. Please check our rental term carefully befor booking. Please follow our house rules during your stay. A security deposit NZ$500 must be paid before / on arrival via inernet banking or by cash . Downstairs 24 hours New Zealand full-service Countdown supermarket. We stayed for three days and had an awesome time. Definitely stay again. A short walking distance to all necessities. Apartment was clean and comfortable. Host was very courteous and helped make everything easy. This apartment was very conveniently located in downtown and had amazing views of the harbor and city. The owner picked us up from the airport and gave us a informative tour of the area. Highly recommended! If you don’t mind dirty floors, tub, kitchen etc than this is the place for you! Found dried food under the couch, black hair on the bathroom floor and in drawers - only four rough towels- no hand towel for bathroom; desk lamp didn’t have a working bulb - walls and floors had hundreds of scuff marks - kitchen back splash dirty and greasy - baseboards and refrigerator in need of major cleaning; pillows on couch dirty - I bought cleaning supplies and cleaned for several hours - also patio area never cleaned! I believe owner is violating condo association rules by renting, as we were told if asked who we are, we should say we were new residents. It did have a good location. Great apartment, definitely book again. Apartment was great, well stocked with everything we needed. 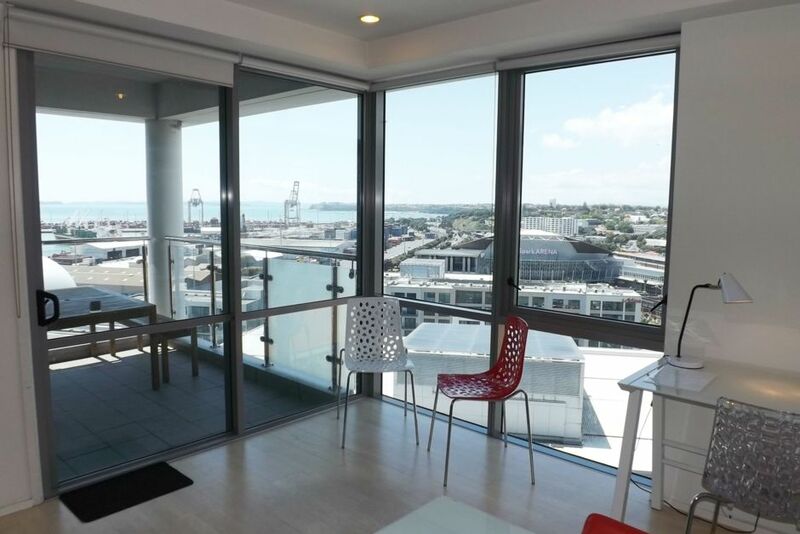 Great location & view, watching the port & ferries/cruise ships at all hours was a highlight & within easy walking distance to waterfront, Queen St 10-15mins, & Britomart train Station 2mins. Host was amicable enough & responded to our queries quickly. Great Shower/bath with good water pressure & continuous hot water for 7 of us. Aircon came in handy, without it in the heat of summer it would be very stuffy as it faces the east. Early morning sun shines directly in which is not the best if you want to sleep in...Be prepared for lots of city noise, even with balcony doors closed its very noticeable but being so close to everything we expected & enjoyed it. Missed out on the 5th star as the keys we had did not access the swimming pool as promised, were told it would be fixed but it still hadn't been by the end of our 4 day stay. With 5 children the pool was a big drawcard and a big reason for booking the apartment so that was disappointing. The pool is a bit of a walk so make sure you have everything you need, its annoying to go back & forth if you forgot your towel or something. Apartment tidy but you can tell it only receives a light clean, would benefit from a deep clean every couple months or so. Other than that the stay was great, well equipped & spacious inner city apartment, much more space than we expected! Thanks Tony we enjoyed our stay & will definitely rebook next time we come to Auckland.